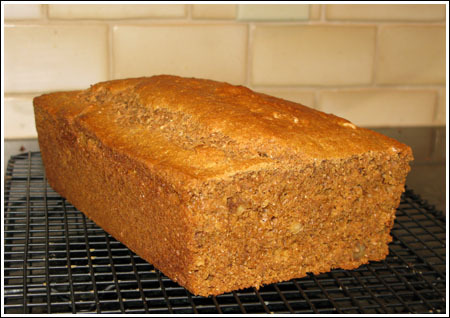 Bran Cake Bread is adapted from one of my favorite cookbooks, Jane Brody’s Good Food Book. I’ve been cooking out of that book since my teens when I found it at the library. Somewhere along the way I acquired a copy of my own…two in fact. I gave one copy to a friend and am now back to one which I pull off the shelf when I need to hear a voice of reason from the nutrition world. Along with a lot of information on nutrition and various types of food, Jane Brody has good recipes. Over the years I’ve focused mostly on her savory dishes, but this week I decided to try some breads and sweets. To start off, here’s an adapted version of Jane’s “Bran Cake Bread” which I plan on serving Fuzz for breakfast. I think she’ll like it, but it’s definitely not as rich as other quick breads and has *just* enough sweetness. So even though Jane calls it “cake” bread, it’s not nearly as cake-like as a lot of other quick breads. This seems more nourishing. Also, if you like dried fruit I recommend adding it because it will make the bread seem sweeter. I left out the dried fruit because Fuzz doesn’t care for it. Luckily, she loves walnuts. You can toast them quickly in the microwave for about two minutes before chopping. Preheat oven to 350 degrees F. Spray a 9×5 inch metal loaf pan with flour-added cooking spray or grease and flour. Combine bran, milk and molasses in a medium bowl and let sit for about 10 minutes to soften bran. Mix the flour, sugar, baking powder, baking soda, salt and cinnamon together in a large mixing bowl. Stir in the toasted nuts and dried fruit. Add the egg, vanilla and oil to the bran mixture. Stir well, then dump the bran mixture into the flour mixture and stir gently to combine. Pour into pan and bake on center rack for about 50 minutes. Cancel my above question about wheat bran and unprocessed bran, I finally put the right words into Goggle and got my answer. Being a visual persona, I’m kind of bummed put by the fact that Brody’s book doesn’t contain photographs. So thanks for this post. I will definitely try it. Thanks also for the tip on toasting walnuts in the microwave. Good to know that can be done. Jane Brody brings memories of years gone by! She was an early advocate for healthful eating, and this recipe reminds me of the kind of breads and bran muffins I used to bake. I’ve got a bag of dried cranberries that would be great added to this recipe. Mmmm…this looks great! I love bran stuff. Yum, this looks great! I’m a huge fan of bran anything. Can’t wait to try out the recipe. Mmm, this bran cake sounds delicious. I love the flavor that molasses can provide for a dish. I’m with Fuzz: walnuts are awesome! Looks like she’ll be in for a real breakfast treat. cake and bread into one form? mm! Hi Anna, is wheat bran the same as what you used? The bread looks reallly good. Thanks! Can you really toast nuts in the microwave? I’ve never heard of this before! Do they get as toasty as they would in the oven or in a skillet on the stovetop? Derek, I think it’s sweet enough and low fat enough to where regular butter would work well. Peanut butter might work….it would be like putting peanut butter on a bran muffin. Carrie, you could give it a try. I weighed the bran and got 2.25 oz. So for All Bran cereal, you’d probably want to weigh out 2.25 oz to get the same mass. That’s probably a little less than 2 cups of All Bran. Use the scale. It’s worth a shot! Katrina, I did know that. LOL. Karen, I think I might try the brownies tomorrow. The only thing I don’t have is the dry milk powder. Also, have you ever tried the Baked Spinach Squares? Those sound good. I haven’t thought about that book in ages! I’m sure it’s still in my basement somewhere. I was really into that book, too, back in the mid 80s. Maybe I’ll dig it out again. This cake looks great, just the type of thing I like to have for breakfast. I would love this, bet you knew that. That does look good. Do you think there is anyway that Allbran cereal would work for the bran? I have a box to use up and this looks good. If I give it a try I’ll let you know. Looks good and healthy… just needs a nice slathering of PB and honey now :).